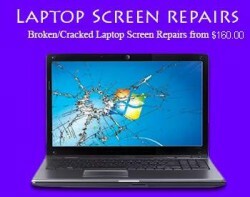 A replacement laptop screen is a new screen that we can put into your laptop if yours gets damaged or stops working. It is sort of like buying a new monitor for your laptop, except that it requires a bit more work than to simply plug in and go. To change your laptop screen it’s best to take it to an experienced technician. We can supply and fit your laptop replacement screen in just a few business days, depending on make and model. This seems to be something we deal with all the time as well. We see all kinds of laptop LCD Replacements at Dan’s Pc Services. Sometimes it’s just a matter of the computer being dropped, and the screen cracking. But, other times just over time the LCD can stop working for one reason or another. The problem is that laptop screens can be very expensive. They run anywhere from $160-250 depending on the size, the rarity, etc. But, all in all if you’d rather keep the computer, you won’t find a better LCD Replacement service here in Hervey Bay call us today on 0477063039. Faulty LCD screen – LCD replacement is necessary. Hook up an external monitor through the VGA port on the back of your laptop. If the display is normal on another monitor but not on your screen, then the video card is ok. This may mean that the screen or the signal cable may need to be replaced. This is easy for us to diagnose, and we can provide an exact estimate for you upon sending your laptop in. First off, make sure you are after the right size. This is something that is absolutely necessary. Without buying a laptop replacement screen that is the right size, you would definitely be returning it or wasting your money. Only the proper sized screen will work, so make double sure that you are looking at the right sizes. Another thing to consider is compatibility. Make sure that your laptop is compatible with the replacement screen that you will be getting. This should be easy enough, as most replacement laptop screens clearly state what makes and models they will fit. Some PC screens are interchangeable, depending on screen size resolution. However, there might be different situations where this isn’t the case, so just make sure to keep track of this. Price is going to be very dependent upon what type of laptop screen replacement you buy, so make sure you read all of the specs to make sure that you are getting what you need. We do not recommend buying a screen and replacing it yourself, as you could damage your laptop even more then just the screen!.